CAST is a Massachusetts-based organization promoting UDL, or Universal Design for Learning. I first saw their Book Builder presented at a conference a few years ago, and must say it has improved greatly in selection and ease of use. 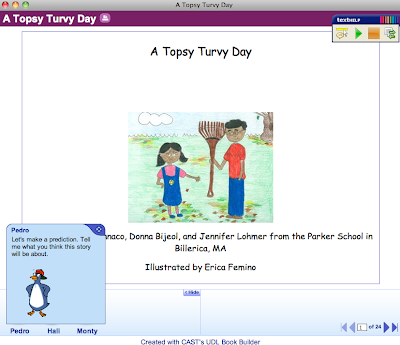 The UDL Book Builder is designed to present books created by educators in a way that is accessible to all, with a screen-reader and skill-building helpers built into the site. There are now hundreds of books available on the site, ranging from early to advanced grade levels and aligned with curriculum topics. For each book, and on many pages throughout each book, three characters can be clicked on to pose skill-based questions around predictions, interpreting illustrations, etc. It's a great resource within therapy sessions and also one to bookmark in classrooms as part of your consultation activities. Pedro, Hall and Monty can be clicked on during the book to pose strategy-based questions related to the text and pictures. Generally, each character provides a more explicit cue, leading to a model of the skill by Monty, the 3rd character. This is so easy to use andvextend lessons you are already doing. A great way to increase higher order thnking in some lower level leathers. I agree, Andrea- great context to work on simple story form, informational structure or categories, AND the strategies of using pictures to gather meaning, predicting, etc. Thanks for your comment.